At least Broyles (Lance Reddick) had fun during this episode. I wonder if this is going to be a tradition now. Last season, right before the very few remaining episodes of season two, the creators of ‘Fringe’ delivered the very strange, but rather lackluster “Brown Betty”. It was a half-hearted attempt at a noir/musical episode. As with this week’s “Lysergic Acid Diethylamide“, “Brown Betty” was named after and fueled by a drug of Walter Bishop’s choice. Once again, this is another example of creators of ‘Fringe’ coming up with a wacky idea, but not going all in. “Brown Betty” was disjointed and the musical numbers were not frequent enough to really send it over the top. “Lysergic Acid Diethylamide“ shows us a journey into Olivia’s head, half of which is animated. The animation is okay, and seems to be mainly there for the benefit of Leonard Nimoy, who recently turned 80, to not have to run around being chased by an angry mob. If they were going to do this, then the animation should have started as soon as Walter and Peter entered Olivia’s head. The animation sequences were an interesting idea, but style was rather weak. In fact, other than William Bell, the cartoon versions of Walter, Peter, and Olivia, didn’t really resemble them very well. To me, this is another bit of going only halfway on an idea. The animation should have been spectacular or even really crude. ‘Community’ had an entire episode filmed in a classic stop-motion puppet style for that show’s Christmas episode this year. That show went all in and the result was hilarious and poignant. Then there’s Broyles. His accidental acid trip may have been the saving grace of the episode. 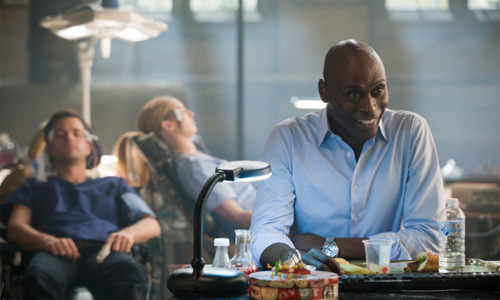 Lance Reddick looks creepy enough when he smiles, being so serious all the time, but his loopy behavior justified his super huge grin. This was a silly idea, but Reddick went for it and the results were pretty amusing. The crowning touch was when Broyles hallucinated a cartoon bird landing on Walter’s shoulder. So what did we actually get out of “Lysergic Acid Diethylamide“? Olivia is finally free of Bell’s control, which turned out to be a plot thread ripe with possibilities, but was never fully realized. Bell has presumably “died” as a result of Olivia’s return. However, the ending did add a much needed zing to the episode, when Olivia nonchalantly said that the mystery man from her dream world was probably the man that’s supposed to kill her. ‘Fringe’ is wacky enough as it is, and really doesn’t benefit from episodes like this or “Brown Betty” unless the creators really go for broke. Some of the most interesting episodes of this show’s forefather ‘The X-Files’ were strange but fun takes at playing with other genres and themes. However, when Mulder and Scully ended up in a black and white riff on ‘50s mad scientist movies, it was with full commitment. I didn’t hate “Lysergic Acid Diethylamide“, but in a season as compelling and exciting as this third season of ‘Fringe’, it’s extremely underwhelming.